The eventual resignation of Zuma and the installation of President Cyril Ramaphosa has created a powerful new optimism in the South African economy. As an economic stimulant, nothing is really as effective as optimism. When consumers and businesses are optimistic about the future, they spend more and invest more which creates new business activity and creates new jobs. This in turn creates more spending in an upward spiral. So South Africa has entered a new “honeymoon period” – quite similar to that which gripped the country after Nelson Mandela took control. One of the key elements of this will be its impact on overseas investment. We can already see that through the steady improvement in the rand/dollar exchange rate as overseas investors seek rands to finance their projects. Of course, the length and extent of the honeymoon period will depend on how effectively Ramaphosa implements reform. Any significant misstep on his part could cause a reversal back towards pessimism. We believe, however, that the future must be a vast improvement on the past no matter what transpires. Of course, Ramaphosa will also be able to ride the wave of the international recovery – so there are two forces working towards far stronger economic growth in this country. Cyril Ramaphosa, having become the president, has a number of urgent matters to deal with. He has set Eskom on the path to recovery (with the help of a R5bn cash injection from the PIC and a new R20bn facility from the major banks), but the mining industry desperately needs attention. As a massive potential employer, our new president cannot ignore the disaster perpetrated by the previous administration. This meant, first and foremost, getting rid of the current minister and he has been replaced by Gwede Mantashe. Mantashe says he wants to have a new mining charter out within three months – although whether this is achievable remains to be seen. What is certain is that Mantashe has a reputation for being compliant – so we can probably expect an industry-friendly charter fairly soon. If the mining industry gets what it wants, it is safe to assume that tens of thousands of new jobs will be created over the next few years. The mining industry is very optimistic about the future under Ramaphosa and is talking of a doubling of investment in 2018. The decision by parliament to implement a change in the constitution to allow expropriation of land without compensation is fraught with difficulties and there are many important questions to be answered. What it does indicate is that Ramaphosa is concerned about the EFF and their populist support base among the poorest South Africans. Ramaphosa is apparently attempting to cut the ground away from under the EFF’s feet before the 2019 election. What is clear is that Ramaphosa has forced the EFF to move further to the left politically, and Malema is now making very radical and improbable statements about all South African land belonging to the government. Obviously, the impact of expropriation without compensation will depend very much on the way in which it is implemented. But early indications are that it is not a major issue at least for foreign investors at this stage. We don’t think that it de-rails the Ramaphosa honeymoon to any major extent. The most important parts of the budget are the 1% hike in VAT and the R85bn cut in state spending – which is mostly money that has been taken from the provinces and municipalities. The combined effect of these two measures will be to make up the R51bn shortfall reported in October and to move towards re-establishing fiscal discipline. We always expected that VAT would be hiked by two or even three percent and we have previously warned on this – so the 1% hike was a pleasant surprise. The cut in state spending will have a bad effect on the construction industry – but that industry has largely given up hope of any major infrastructure spending on the part of the state. Of course, there is the R57bn for higher education – but that is over the next 3 years and only R12,5bn comes through in this year. The next logical step would be to reduce the size of the civil service – starting with cutting down the number of ministries and ministers. This process is beginning with Ramaphosa’s recent cabinet reshuffle. The reinstatement of Nene as Finance Minister is a significant step in the right direction. Further downgrades by the major ratings agencies have been avoided and the stage is set for further reform. The government borrowing problem is back under control for the moment and we can expect further improvement going forward. The cabinet re-shuffle with the elimination of Gigaba as finance minister and Zwane as mining minister, together with the appointment of a new and credible board for Eskom, are Ramaphosa’s most important and positive moves to date. The incompetence and ignorance of these two ministers was a major drag on the South Africa economy and Eskom’s parlous financial position threatened the entire economy. Nene is clearly the right man for minister of finance and we can expect a sober and conservative management of the economy. With Zwane out of the way the road is clear for a new agreement with the chamber of mines that will hopefully result in massive foreign investment in our mining industry – with a commensurate impact on jobs and the economy at large. There are still some anomalies in the cabinet, but Ramaphosa has shown himself to be circumspect and careful in most of his decisions so far. With the advent of Cyril Ramaphosa, the growth prospects of South Africa are improving steadily. Economists expectations vary between 1,9% and 2,3% for 2018, but we believe that the final figure could be higher. We totally disagree with the Treasury’s estimate of 1,5% – but perhaps they are being very conservative. If growth is above the 1,5% that they estimate then obviously its means tax collections will be higher than projected and fiscal consolidation (i.e. the paying down of government debt) will proceed more quickly than projected. 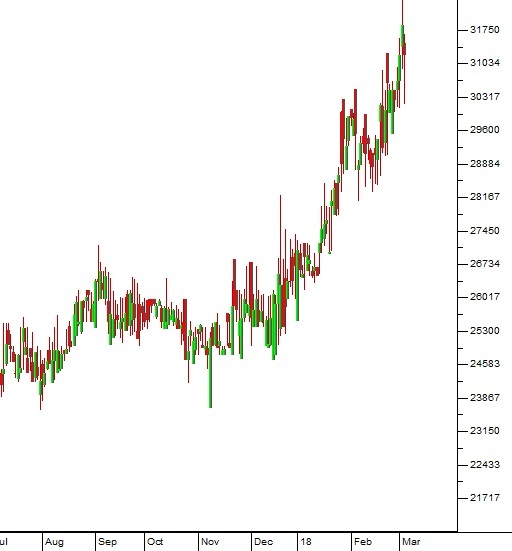 The sharp improvement in confidence and the flow of money into the country can be seen by the gains which the rand has made against hard currencies and especially the US dollar. Beyond this rush of money into the country it is evident that local businesses are beginning to invest again and that they are benefiting from the general recovery in the world economy. This can be seen in January’s impressive R15bn trade surplus which indicates that our exports are growing much faster than our imports. On the home front retail sales are better than expected because, with the falling inflation rate, real incomes have improved by 2% and South Africans are out there spending again. It has been well said that the South African economy is a “light switch” economy – it is either off or it is on – and the arrival of President Ramaphosa has almost certainly flipped the switch from off to on. The steady fall in food inflation since the end of the drought in most parts of the country has helped to stabilize prices in the economy and made middle income South Africans better off. Combined with the inevitable drop in petrol prices due to the strengthening rand, the improved inflation outlook will result in increased consumer spending at all levels. Food inflation, and particularly the cost of cereals, has fallen sharply. This impacts the general levels of prices and makes a reduction of interest rates more likely. Of course, the continuing drought in the Western Cape has meant that fruit prices remain high, but overall the picture is looking far better. The inflation rate is now at around 4,4% and is not expected to rise much, despite the VAT increase. This is because 40% of the components of the consumer price index (CPI) are VAT exempt. It is therefore highly likely that interest rates will be reduced on 28th March when the Monetary Policy Committee (MPC) meets again. All three ratings agencies have indicated that they liked the 2018 budget and now see the stage as set for a reduction in government debt. It also now appears that Moodys, which is the only agency which still has SA at investment grade, is not contemplating further downgrades – and the possibility that the other two agencies will upgrade SA is on the table. 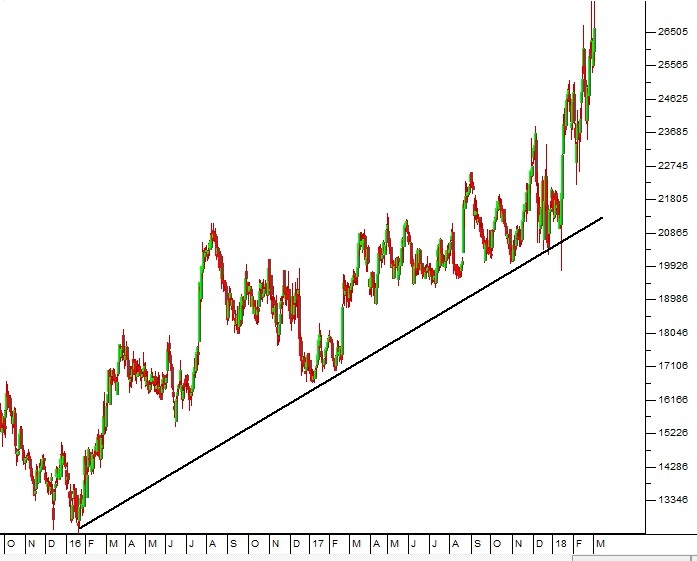 Here you can see that the rand is now firmly in a strengthening channel which began when Pravin Gordan was appointed as Minister of Finance. The weakness resulting from the land expropriation issue is insignificant so far. 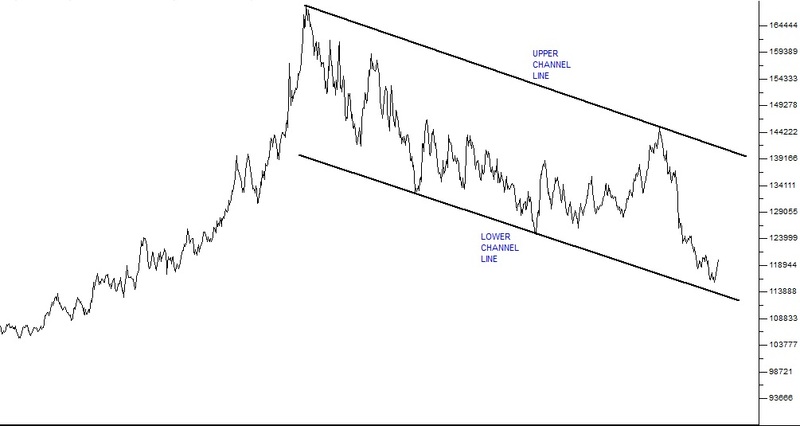 From a technical perspective, it is interesting to note that although each channel line only has two touch points so far, they are parallel – an indication that markets do not move at random. The correction in the S&P500 index was both inevitable and healthy. Clearly, the S&P could not continue going up at the rate that it was without something happening. We have said and continue to believe that this is a correction and therefore a buying opportunity – rather than the start of any sort of bear trend. The growth in the forward estimates of earnings for the S&P500 companies underscores this position. Thomson Reuters reports that the forward estimated earnings for the 4th quarter is $158 per share for the S&P500 companies. This means that the forward price:earnings ratio (P:E) is now about 17,5 and the price:earnings growth ratio (PEG) is well below 1 at 0,87. This implies that the S&P500 has further upside potential – and thus that the correction is unlikely to persist for very long. Not surprisingly, in this correction, the S&P is testing the efficacy of its long-term upper channel line. It is difficult to determine exactly how long the correction will last, but we remain of the view that it will be far shorter and sharper than previous corrections which persisted for as long as 8 months. We believe that the S&P will make a new all-time record high within the next two months. When considering the possible future path of the S&P, it is necessary to consider the US economy and the reasons for this correction. Essentially, there is nothing wrong with the US economy, which continues to grow at a prodigious rate. In fact, it is that very growth which initially “spooked” the market. Whenever the economy in America does particularly well, investors begin to become concerned about interest rate increases. They disinvest in anticipation of the Federal Reserve Bank adopting a more “hawkish” stance and raising rates more quickly. Then, positive numbers emerge from the economy to re-affirm bullish sentiment and the bull trend continues. We expect that the next set of growth figures, unemployment figures, new housing starts or quarterly profit figures in America will supercede the current negativity. The S&P will then resume its upward trend followed closely by the rest of the world. Of course, into this situation, Trump threw his “steel tarrifs” and that was good for steel stocks, but hammered the rest of the market. Opposition from republicans like Paul Ryan, who are afraid of a trade war, has helped the market regain some perspective. All these factors are pushing Wall Street one way and then the other, but sooner or later the underlying growth in that economy will make itself felt again and the correction will be over. The trick is to get the timing right – when exactly is the bottom of this correction or have we already seen it? In our view, the market is already recovering and further downside is unlikely. Of course, a trade war with China is economically insane and flies in the face of everything that America stands for. The American economy is entirely based on Adam Smith’s principle of laissez faire capitalism in terms of which each country does what it is best at and then trades with other countries to get the things that it does not produce as well. For decades now the Chinese have been far better at producing steel than anyone else. They import iron and chrome and other minerals (from South Africa among others) and then manufacture various types of steel which are then exported to the rest of the world – including America. America simply cannot make steel as cheaply as the Chinese can make it and land it in America. That is the reason for the existence of the “rust belt” in America –where the old steel factories of America lie rusting away. If Trump is successful in getting his steel tariffs then Americans will simply pay more for steel – which will negatively impact growth and inflation. It will also cause the Chinese to retaliate by imposing tariffs on various American imports. Both countries will be worse off – which is why Wall Street does not like this idea at all. In our view, common sense will prevail and this will become another derelict policy defeated in all likelihood by bi-partisan opposition. Disruptive technologies are making and destroying businesses all over the world at an increasing pace. The classic historical case is that of the Swiss watch industry – which was brutally and completely displaced by digital watch technology in just a few short years. The advent of the smart phone has revolutionized communications and access to information in such a way that no one really knows quite what will happen next. The advent of 5G, for example, is going to change the world in ways that nobody can predict. With 5G you should be able to download a full-length movie in about 1 second. And this is imminent – it is going to happen in the next few years, in first-world countries to begin with, and then in South Africa. Of course, the overwhelming and entirely predictable aspect of any new technology is that it brings with it greater efficiencies and hence greater profits for listed companies – otherwise it would not come into being. But it can be very difficult to know exactly where to invest to benefit. For example, 20 years ago it was thought that platinum would be the new oil because fuel cell technology would sweep the world. Now it is apparent that commodities like cobalt and nickel are what will be in demand – mainly for electric car batteries. In any event, as a private investor, it is very important to keep reading about new technologies and try to understand how they will or could impact on the shares which you are interested in. Sibanye, run by Neal Froneman, has fallen from its height of R70 per share to just R12.50 over the past 18 months. The company has been on an aggressive acquisition trail buying up all the precious mineral assets it could lay its hands on. It bought Angloplats’ Aquarius platinum and the Rustenburg mines, then Stillwater in the US and now finally Lonmin (mainly for its smelters and refineries). Altogether, this makes Sibanye the second largest platinum miner in the world. Froneman has bought everything through the bottom of the precious metals cycle and Sibanye’s balance sheet is stretched to the limit with over R23bn in debt. However, its recent results are above expectation and the company is now focused for the next three years on reducing debt. In our view, Froneman has been very smart in what he has done and now owns a remarkable set of assets which he paid very good prices for. If the precious metals markets continue to improve (which is what we expect) then this share could easily go back to R70 over the next few years – but clearly there is significant risk. 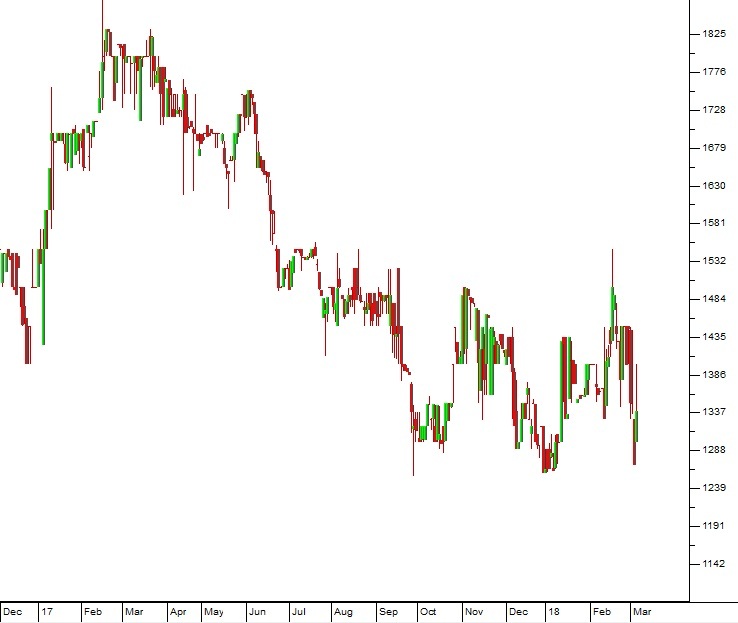 The share’s steady downward trend does not make for a great chart and technically it does not look good. 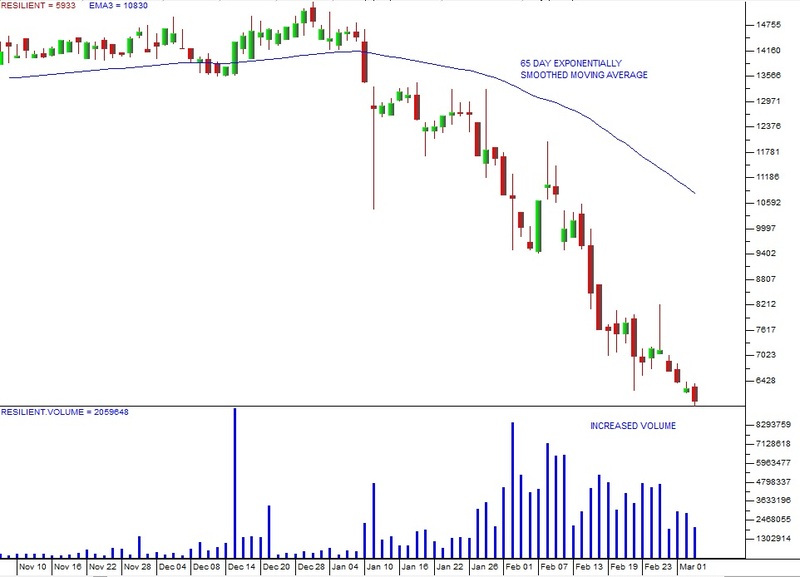 But if Froneman can reduce debt – which is now his number one priority – then we believe that with the advantage of hindsight, this share will prove to have been excellent value at R12.50. If you are looking for a disruptive technology that could perhaps yield exceptional results, this may well be it. The 65-day exponential is much more sensitive to the daily market movements than the equivalent simple moving average because it weights the more recent prices more heavily and the older prices less heavily. The effect is a moving average which follows the trend more closely. In our experience, when a blue chip share like Resilient falls heavily like this, waiting for it to break up through the 65-day Exponential usually gives very good transaction timing without significant risk. You can see that the 65-day E is falling more and more slowly as it approaches the day-to-day prices of Steinhof. By the time the uncertainties are dealt with, the 65-day E should be well below R10 per share and probably offering an excellent buy point. One point of concern is its recent fall below 465c which occurred on Friday 2-3-18. 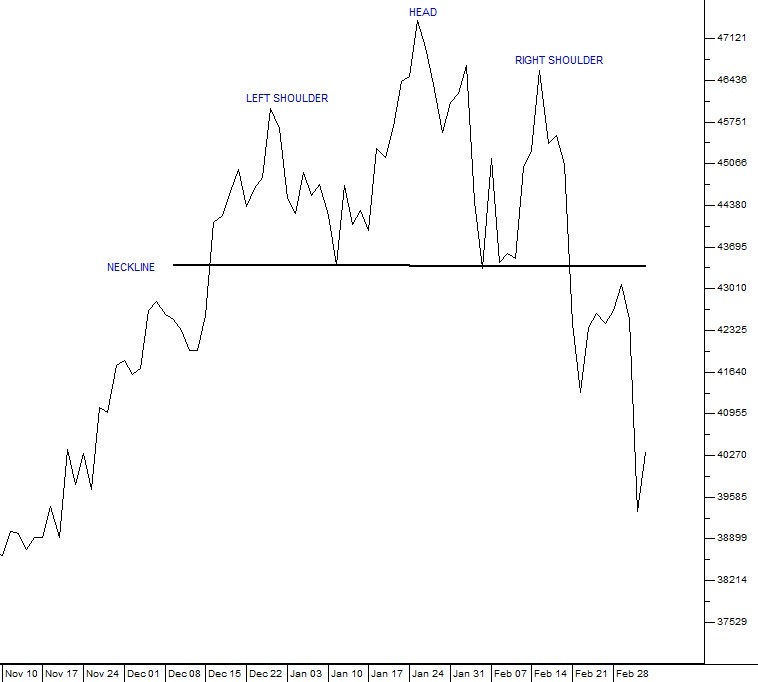 This takes it through the earlier support and indicates that there may be further downside. But you should not be worried because it is still far from breaking up through the 65-day E. And if you buy in at lower levels, you will have one great comfort – at least you did not buy at R58. But out there, there are many (mainly institutional) investors sitting with their pockets full of Steinhof shares that they bought for R58 and much more – and you will be doing a whole lot better than them! Cartrack specialises in vehicle security and recovery. In the past six months their subscriber base has increased by 66 000 to 750 000. Its main base is in South Africa, but it has spread its business to the rest of Africa, Europe, Asia and America. The company’s impressive 93% recovery rate has enabled it to begin offering a R10 per month theft-only insurance policy which is aimed at lower income groups who cannot afford to replace their vehicle if it is stolen. The share price has gone up about 80% over the past year, reflecting its debit-order business model and steady expansion. We believe that this company is an ideal investment with very low working capital and a growing passive income. It also has the advantage of becoming a rand-hedge as it spreads its service to other countries. Curro reached a very high P:E multiple of 248 on 31-12-15, more than two years ago. Since then its P:E has been falling back towards more reasonable levels. Following its results for the year to 31st December 2017, the share fell back despite headline earnings per share rising by 17%. Clearly, investors were expecting more. The multiple has now fallen back below 80 – which is still one of the highest on the JSE, but far more reasonable than 248 – which was obviously unsustainable. The reason for Curro’s extraordinary multiples is its enormous “blue sky” potential as it systematically fills the enormous gap left by the poor government education system. An additional factor is that it was launched by PSG – who have a reputation for developing excellent listed companies – like Capitec. We still see Curro as very fully priced and we think that the potential for a downward re-rating is higher than the opposite. Glencore is a diversified international mining and commodities group that is listed on the JSE. The important point about Glencore is that it will benefit directly from the switch to electric motor vehicles which is taking place world wide – because it is a major producer of copper, cobalt and nickel – all of which are needed to make electric vehicles and storage systems (batteries). Glencore commissioned a study of the demand for these metals in the event that 30% of vehicle production consisted of electric vehicles by 2030. They found that an extra 4 million tons of copper, 1 million tons of copper and over 300 000 tons of cobalt would be needed. We believe that the production of electric vehicles and battery storage systems is going to spike in the next few years. Glencore is the obvious choice if you want to capitalize on this trend. Anglo’s results for 2017 were spectacular. Boosted by the sharp recovery in commodity prices and a significant down-sizing led by CEO, Mark Cutifani, the company has managed to pay down debt from $13bn to around $4,5bn. The sale of its thermal coal assets which supplied Eskom in South Africa means that it no longer has to worry about Eskom’s requirement that suppliers are 51% black-owned. 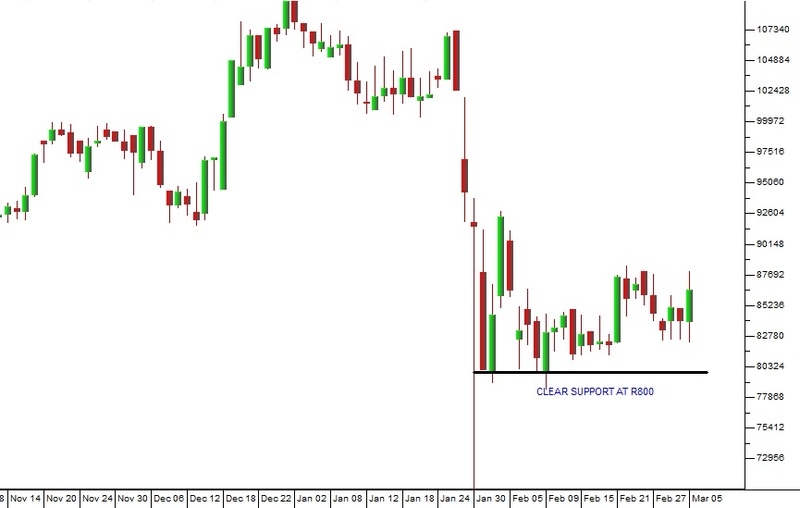 Its base metals (iron, manganese) have performed well, especially Kumba. The number of mines has been cut in half from 68 to 37 with only 17 of those falling inside South Africa. Cutifani says that he has had business dealings with Ramaphosa in the past and perceives him as an honest broker who means what he says about ensuring that mines remain profitable and deliver returns. We expect Anglo to continue to be profitable and to cut debt further this year, mainly because we expect commodity prices to continue rising. To view a the visual presentation of this report, click here. To be put on our mailing list for the next report, click here. All information and data contained within the PDSnet Articles is for informational purposes only. PDSnet makes no representations as to the accuracy, completeness, suitability, or validity, of any information, and shall not be liable for any errors, omissions, or any losses, injuries, or damages arising from its display or use. Information in the PDSnet Articles are based on the author’s opinion and experience and should not be considered professional financial investment advice. The ideas and strategies should never be used without first assessing your own personal and financial situation, or without consulting a financial professional. Thoughts and opinions will also change from time to time as more information is accumulated. PDSnet reserves the right to delete any comment or opinion for any reason.